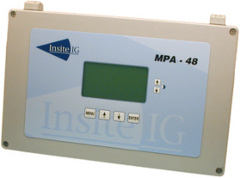 The InsiteIG MPA48 is a unique system that accept any combination of 1 to 8 standard InsiteIG sensors (DO, SS, pH, or ORP), and automatically configure for the correct operation. The system allows for flexible and economical process monitoring and control. The MPA-48 has a graphical LCD display that is backlit and UV protected. There are two lines per sensor for standard sensor information. 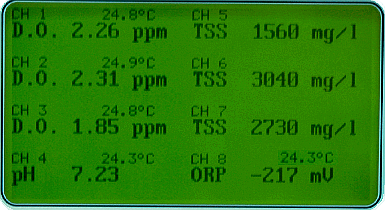 The top line displays the channel number, and temperature for DO, pH, and ORP sensors. The bottom line displays sensor type, reading, and units of the sensor. The MPA-48 will automatically recognize the sensor type (DO, SS, pH, or ORP) and configure itself for proper operation. The DO sensor will come factory calibrated and ready for use. The SS sensor is zeroed at the factory, and comes with a default calibration curve. The pH electrode is factory calibrated with its holder, and the ORP electrode is matched with its holder. To utilize factory calibrations for SS and pH, sensors must be connected to the analyzer and channel indicated per the "Factory Sensor Configuration" label located on the analyzer. Custom sensor configuration is available upon request.